Interested in seeing updated coverage analysis of your nightly builds or after each change to the source code? Coco can easily be integrated with various build and test frameworks to serve as a component of a Continuous Integration (CI) system. 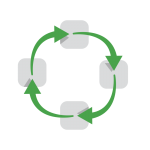 Jenkins – Integration with the Jenkins and also Hudson CI can be achieved through the Emma Plugin. SonarQube – Integration with the quality platform SonarQube is available via the Cobertura XML output format. The various output formats and command lines allow for integration with any other 3rd party or home-brewn system.